Florida has specialty license tags for every thing you can think of - all good causes and worthwhile. To someone in the midst of making a decision on which to support, may we say, "What better choice could you make than investing in a child's future?> That's what the Police Athletic League (PAL) tag does: it directly funds beneficial programs for Florida's youth. We want good things for our children. We want them to be good citizens, do well in school, and have successful lives. We know that children need help and guidance to achieve these things. Through PAL, a non-profit, juvenile delinquency prevention organization, law enforcement officers and caring volunteers mentor and encourage children in character-building activities. PAL's slogan is "Filling playgrounds, not prisons," because PAL has always believed that preventing trouble is better than cleaning it up afterwards. Why buy a PAL specialty license tag? The simple answer is because your support helps Florida's youth. Proceeds from the tag sales fund the State of Florida Association of Police Athletic Leagues (SFAPAL) college scholarships and numerous PAL programs, which are designed to enrich children's lives - programs that range from traditional sports, like boxing, basketball and football, to after-school programs, leadership training, and community service programs. "When I started off," Tacoi says on the thirty-second You Tube spot, "I thought PAL was about community service. I could get the community service [hours] I needed for school. Quickly, I learned it was more than that. PAL helped me to learn that you should be a leader, not a follower. It helped me on the football field, too. I was always good, but I didn't have the voice to go along with it. Now I've stepped up to be a leader, and people look up to me." Tacoi joined the Police Athletic League when he was thirteen so he could earn community service hours, but when he attended his first PAL Youth Directors' Conference in Orlando, his perspective on PAL changed. "I learned so much from just one convention," Tacoi had written in a letter to the PAL state office earlier this year. 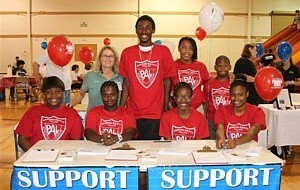 "I learned that PAL was more than just a way to earn community service. It is a program to help kids of today and tomorrow." He saw all the programs that are anti-gun and anti-gang. He saw that PAL was helping kids stay off the streets and showing them that they could get along with police officers. He also began looking up to the PAL kids on the Youth Conference Committee (the YCC), the youth committee that plans and runs the SFAPAL's annual youth conference. Getting on that committee became his goal. Then it happened! "Being appointed to the YCC was probably the best thing that has happened to me in PAL," he wrote, "because it has led to so many great things for me. Not only do I continue to learn more about the dangers of drugs and alcohol and gangs, but I've received professional speaking lessons from the best. The training for the YCC not only trains you for PAL, but it trains you for life." "When I tell people I'm an officer and working with PAL, they say, "Yeah, PAL's that program that plays basketball and football." But I tell them it's more than that," he said on this thirty - second video that you can hear and see on You Tube. "We're not just teaching sports - we're teaching life. We're teaching kids to become men and women in their community, productive citizens. That's what's important to us, so please help us help these kids by purchasing a PAL tag at your local tag agency." These video spots on You Tube are very effective tools for getting the word out about PAL and the PAL tag. Thank you Tacoi and Officer Flores!